There was a brief moment of introspection when Tenzin Gyatso, His Holiness the XIV Dalai Lama delivered his inaugural lecture at the opening of the 'Festival of Tibet 2000', in Mumbai, this week. The spiritual-political leader focused on the 'cultural genocide' and human rights violation inflicted by the Chinese government and the tortures the Tibetans have been going through in the Chinese occupied territory for over 40 years. 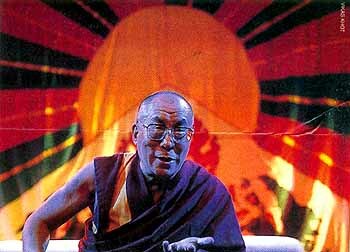 The six-day festival in the city has been organised by Friends of Tibet (INDIA) and the Tibetan Youth Congress. Mumbai is the first leg of a series of exhibitions that the two-year old group is planning across the country. Following Mumbai, the festival will travel to metros in South India over the next four months. Last year, photographer Diane Barker's exhibition marked the preview to the festival. 'It barely created a whimper and we knew immediately that to raise an awareness for the cause of the Tibetans we had to out forward an exhibition on a much larger scale,' says Sethu Das, president of Friends of Tibet (INDIA). 'We needed a forum where our voices would be heard.' The group had made an attempt to achieve this by involving people from all walks of life at the festival. Hence, films, photographs, food, dance and music formed a part of the festival. Among the films screened were Martin Scorsese film Kundun which tells a story of a giggling child who transforms into the figure of the Dalai Lama and raises the world's consciousness about Buddhist society, the plight of Tibet and the suffering endured by her people. The Shadow Circus: The CIA in Tibet', a film by Ritu Sarin and Tenzing Sonam, was put together using unique archival footage and exclusive interviews with former resistance fighters and CIA operatives. And Why Are We Silent? by Garthwait & Griffin was an advertisement film in support for the cause of liberation of Tibet from China. Reciting portions of the UN Universal Declaration of Human Rights were Hollywood stars Harrison Ford, Richard Gere, Goldie Hawn and Julia Roberts. 'Dances from the Roof of the World' packaged 21 traditional songs and dances by the students from the Tibetan Children's Village, Bylakkuppe in Karnataka. A group of 30 children put forward performances from different regions of Tibet. The highlights were the Ngonpa, ritual dance from the hunters and masked dancers representing the Buddhist diety of Chakna Dorjee, the destroyer of evil. Ralpa is the dance of the wanderers who travel from village to village singing and dancing, spreading their poetry and wisdom collected through their journeys. While Chanshae is the song of the drinking in celebration of joy and happiness. Tashi Shoelpa, the white bearded mask dance is the realisation of the dream of fifth Dalai Lama. 'Butter sculpture' was a ritual done to mark the triumph of Lord Buddha over his six non-Buddhist teachers who challenged him in performing miracles. On this day every year — the fifteenth day of the first month of the Tibetan calendar — huge butter sculptures are erected, among other offerings. Later they are distributed to the monk and lay people. It takes a month for six monks to complete a traditional butter sculpture. It is believed that by making such offerings, positive collection of Karma is created. Since the climate in India does not facilitate the use of butter, ghee mixed with wax was used on a miniature scale for the purpose.